Siamo orgogliosi di includere sul nostro sito web solo gli alloggi, agriturismi, e imprese che sappiamo offrono servizi ad alto livello. Comunque, in caso di un’esperienza meno positiva sarei grata se mi potesse far sapere i commenti tramite una mail a info@ballooningintuscany.com. Montisi is an historic village located about half way between Rome and Florence, in southern Tuscany. Siena lies to the north while the wine towns of Montepulciano and Montalcino are about 10 miles away to the south and to the west. The village is sited on the ridge of hills separating the Val di Chiana and the Crete Senesi, a unique landscape of rolling hills, and close to the stunning Val D’Orcia, a World Heritage Site. – Book an hour-long walking tour of the village to learn its history, and to feel at home. Take a Quad bike tour for a half-day ride through the fields and back trails, go horseback-riding, or visit surrounding villages, monasteries, Etruscan and Rome ruins, or enjoy a coffee or glass of wine in a village piazza. – For serious bikers, rent high quality bicycles and enjoy our hills or take a lesson or two in painting and drawing with one of Montisi’s professional artists. Book a wine tour or a tasting either in Montisi, or in the nearby wineries producing Brunello, Chianti and Vino Nobile. Take day excursions to see the great art and architecture of Tuscany’s historic cities Florence and Siena, shop for Italian designer wares, hear Gregorian chants, wander through Arezzo, famous for antiques, or relax in the hot mineral waters of Bagno Vignoni. Look at our Facebook pages for news and more pictures. La Romita Hotel and Restaurant, we owe a special thanks to Alberto and La Romita for the use of their field to launch our balloons. It is located centrally within Montisi and houses an excellent restaurant, comfortable lounges, and quiet corners. The hotel is surrounded by lovely gardens with stunning views of the countryside. The property has a large sun-drenched swimming pool. La Locanda di Montisi is a charming small hotel located in a medieval building in the heart of Montisi. A convenient location with modern amenities in every guestroom, superb service, and free Wi-Fi. Santa Caterina bed and breakfast in Montisi, is a modern house with beautiful views. Five bedrooms, delicious home-made breakfasts, and a swimming pool under the olive trees. Casa Parva is a small, charming one bedroom self-contained apartment in the heart of medieval Montisi. It has been fully restored and renovated to an excellent standard, with antiques, paintings, and attention to detail. Antonella Piredda, the owner, is also a tourist guide and a cheese and wine expert. Minimum stay 3 nights. La Grancia, in Montisi, is a rare 14th century fortified farmhouse, with four elegantly furnished apartments. Guests have the use of extensive gardens and a lovely swimming pool and barbecue facilities with dramatic views over the valley and the countryside. Bookings are for the week, Saturday to Saturday, or by arrangement for shorter periods. La Capanna, is a self-contained guest house situated across the valley from Montisi on a rural estate, surrounded by lovely views. Rachel and Michele, your hosts, can recommend a choice of excursions and activities to make the most of your stay. Palazzo Brandano is a 4 star hotel, bar and restaurant in the tiny medieval village of Petroio close to Montisi. Blending excellent service with the cosiness of village life, it comprises beautiful suites, spacious rooms and a selection of apartments within steps of the Palazzo, all restored in authentic Tuscan style. La Locanda del Castello is located at San Giovanni d’Asso, also close to Montisi. The hotel sits within the walls surrounding the castle which dates back to the Sixteenth century. It has nine refurbished and individually decorated rooms. Cretaiole is located just outside of Pienza, between the two great wine regions Montepulciano and Montalcino in the heart of the magnificent Val d’Orcia which is a UNESCO World Heritage site. Let the Moricciani family invite you into their lives to share their Tuscan heritage with you while you are enjoying cooking classes, olive oil and wine tastings, balloon flights, guided tours and more. Podere Salicotto is an inviting, comfortable, spacious accommodation in Tuscany, with clean and beautifully appointed bedrooms in a tranquil environment and caring hospitality. Casa Moricciani is the perfect place to stay for independent travelers desiring to experience authentic Tuscany in refined luxury and style. La Casa di Adelina is an intimate B & B located in the square of the small and charming village of Monticchiello, a few kilometers from Pienza. Having a private guide in Tuscany is the best way to get to know the area, its culture, its people. With a personal guide you can have access to innumerable lesser known art treasures in a landscape of incomparable beauty. You can discover the world of wine and food at a more relaxed pace than that of mass tourism. Antonella offers specially tailored guided tours to follow your balloon flight. Highly recommended! Official Guide for Siena and its territory. Countess, Art Historian, Writer, Scholar of Renaissance Bronze Sculpture, Heraldry and Symbolism, lives and works between Tuscany and Umbria. She also taught at the University of Siena and occasionally cooperates with American Universities in Florence. Many of her writings focus on Medieval and Renaissance Art, Coats of Arms and Symbolism. Small group tours to Medieval Italian villages. 3rd Services Driving Service, can arrange private transfers from a number of locations as far away as Florence. Please contact Gianmarco directly (Italian and English speaking) for rates via email info@tuscanysienatours.it or phone +39 335 6565477 or +39 3381868798. Avignonesi is at the forefront of organic and bio-dynamic farming methods to craft distinct, genuine wines with an even stronger character, and has acquired additional vineyards and a state-of-the-art wine-making facility in the Montepulciano appellation. Choose from Midday Tour and Gourmet Wine Tasting Lunch – Cooking Class – Hot-air Balloon Tour and Wine-paired Gourmet Brunch – Wine & Gourmet Ferrari Tour. Elizabeth Cochrane, offers watercolour lessons for beginners. Even if you have never painted before (and even if you believe you can’t) Elizabeth’s carefully-planned tuition will help your artistic talents blossom. Your morning lesson will take place in the private courtyard of her home in Montisi, where you will be taken step by step through the process of creating a complete watercolour painting. Montisi Magica, offers organised holidays for individuals and small groups in and around Montisi, giving the opportunity to enjoy village life and everything the area has to offer. For a creative break of painting, cooking, tasting and sight-seeing, or a tailor-made holiday of activities and relaxation – such as walking, cycling, historic sites, thermal baths, wines, cheeses, olive oils – for a week or just a long weekend – Ann Alexander makes sure that you enjoy every second of your stay and make the most of the richness of the landscape. 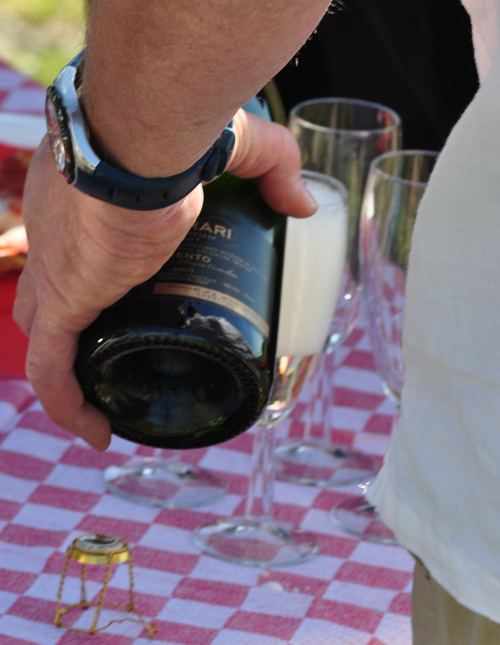 La Cornucopia Italia, expert Guided Wine Tours in Tuscany, Umbria, and throughout Italy! 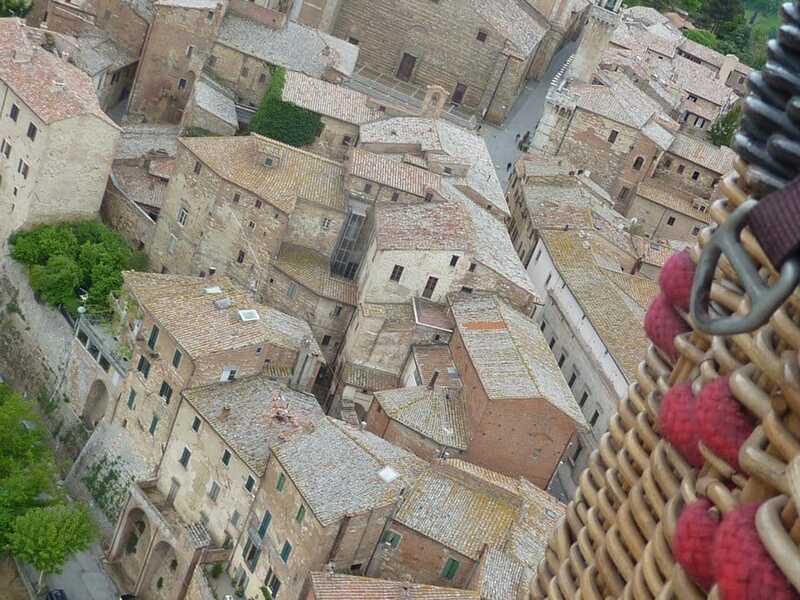 The region maintains a very good website called Terre di Sienna for the sites and attractions in the Siena Province. The site includes information on the many museums and historic sites within the area. Well worth a look. 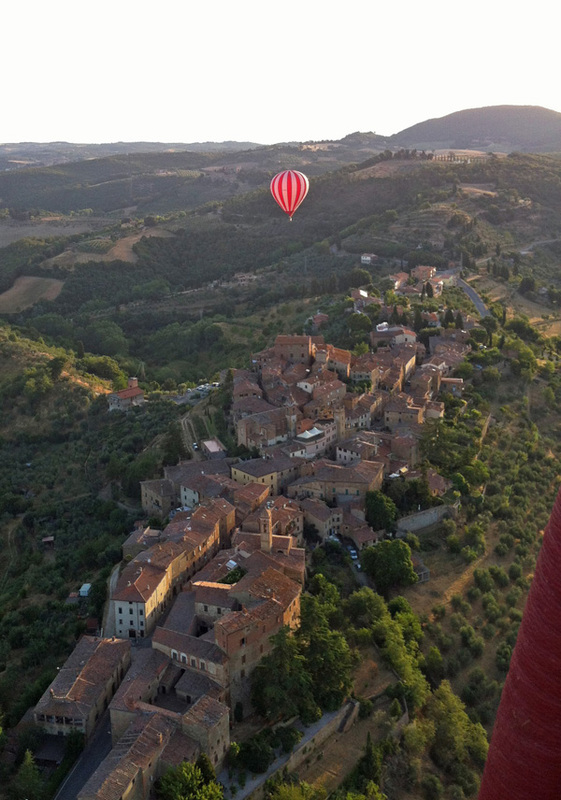 Il Barrino (€€) is a bar run by good friends of ‘Ballooning in Tuscany’ – Gianluca, Cristina, and the family. Situated at the heart of the village, it serves excellent coffee, drinks, newspapers, etc. Upstairs is the friendly and informal Trattoria, where Gianluca’s mother prepares her seasonal specialties. La Romita (€€€), also in the centre of the village, is run by our friends Alberto and Giovanna Bindi, with the food cooked by Giovanna, a Cordon Bleu chef. The food is superb and featuring a very special cuisine: traditionally Tuscan but with some elements of Medieval and Renaissance recipes. Lunch, dinner, and always book a reservation. Taverna da Roberto (€€) is a restaurant run by Roberto Crocenzi who has a broad knowledge of wines and Slow Food. Roberto sources all of the food locally, and the menu is seasonal. The restaurant is open for lunch and dinner, with tables both indoor and outdoor. Reservations are recommended 0577-845159. Palazzo Brandano (€€€) bar, enoteca, restaurant (and four star hotel) has a spectacular terrace with panoramic views over the countryside serving traditional Tuscan cuisine with a modern twist using produce from the area; Tuscan, Italian and International wines are also available. Open for lunch and dinner with daily specials and seasonal treats. Osteria delle Crete, (€) is located in the main village street. Great food, friendly service and lovely village location, perfect for watching the world go by. The Osteria offer morning coffee to multiple plate tasting lunches and dinner. Ristorante Conte Matto, (€€€) is owned by Davide and his family with an excellent menu of Tuscan classic dishes accompanied by an extensive list of Italian wines. Indoor dining rooms and outdoor seating on a lovely terrace. Osteria Caffe’ Ciriera, (€) is a bar/restaurant serving Italian breakfasts, with simple, authentic, and tasty dishes for lunch and dinner. Located in the piazza, looking up at the village church. Casal Mustia, (€€) is a small restaurant, cafe/bar (and hotel) in the centre of this typical Tuscan village, just ten minutes drive from Montisi. Friendly staff, and great food serving locally sourced and quality food. Choose from the outdoor seating in the piazza, or upstairs in the small restaurant.